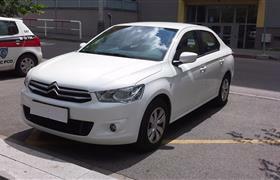 New snow-white Citroen C-Elysee with automatic transmission is enjoyable to drive. The saloon offers convenience and safety features. Luxury car design, excellent dynamic characteristics and spacious passenger compartment will satisfy everybody on long trips.